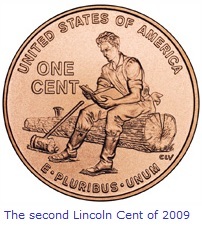 In 2009, a new Lincoln Cent was released to the public, commemorating the 200th birthday of Abraham Lincoln. The occasion also marked the 100th anniversary since the introduction of the Lincoln Cent in 1909. There are four new Lincoln penny designs, all appearing on the reverse of the coin only. The front will continue to carry the familiar likeness of Honest Abe. 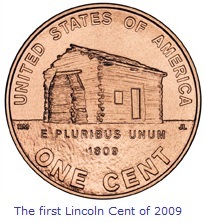 The new Lincoln Cent designs were issued throughout 2009 in three-month intervals, the first was put into circulation on Lincoln’s birthday, February 12th. The four designs represent major chapters in Lincoln’s life: his birth and childhood in Kentucky, his formative years in Indiana, his professional life in Illinois and his Presidency in Washington, D.C.
"This is a momentous occasion in the history of our Nation's coinage because these designs represent the first change in the Lincoln Cent in half a century," commented U.S. Mint Director Edmund Moy at the September 22, 2008 unveiling ceremony at the Lincoln Memorial in Washington, DC. "These coins are a tribute to one of our greatest Presidents whose legacy has had a lasting impact on our country. He believed all men were created equal, and his life was a model for accomplishing the American dream through honesty, integrity, loyalty, and a lifetime of education." 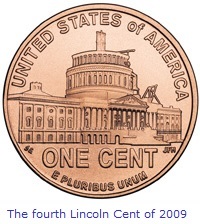 The new 2009 Lincoln Cent produced for everyday commerce is struck on the same type of copper-plated zinc blanks used by the Mint since 1982. However, a limited number of 2009 cents comprised of 95% copper and 5% tin and zinc – the same alloy as contained in the 1909 cent – were marketed to coin collectors. The Lincoln Cent was the first circulating coin issued by the United States to depict a real life individual. From the beginning of U.S. Mint in 1792 up until 1909, the only “person” to appear on U.S. coinage was various allegorical representations of Miss Liberty. This website, US Coin Values Advisor, has entire sections devoted to the history of United States coinage. Interested readers can learn more about the origins of the Lincoln Cent and key date recommendations for collectors. In addition, we provide free value trend analysis for the Lincoln Cent and other U.S. coins. 1809 to 1816: The first issue of the 2009 Lincoln Bicentennial Cent program depicts Lincoln’s birthplace and first home, a lowly log cabin in Kentucky. Release date: February 12, 2009, Lincoln’s birthday. 1816-1830: The second of the new Lincoln penny designs drops in on young Lincoln as he catches a breather while laboring as a rail splitter in Indiana. A prolific reader, he eagerly sought opportunities to crack open a book. Release date: May 14, 2009. 1830-1861: The third new Lincoln Cent of 2009 reminisces on Lincoln’s professional life in Illinois, which eventually lead him to the State Capitol in Springfield. Lincoln gains national stature during his famous 1858 debates with Stephen Douglas. Release date: August 13, 2009. 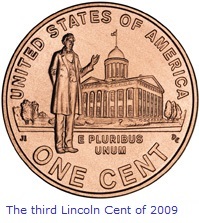 1861-1865: The fourth and final new 2009 Lincoln Cent penny commemorates Lincoln’s years in Washington, DC. The half-finished U.S. Capitol dome symbolizes a country ripped apart by civil war. Lincoln’s presidency is best remembered by his resolve to maintain the U.S. as one nation, and for the Emancipation Proclamation. Lincoln is assassinated on April 15, 1865.